'Insular, parochial and narrowly nationalist: Scotland's anti-Gaelic bigots' - this Herald Scotland article is a wee bit ‘over the top’ (the trademark of too much British journalism these days), but I am well aware of the loss of cultural identity that came from the forced Anglicization of the Empire – my grandmother was a Gaelic and a Doric speaker, but she hadn’t spoken Gaelic for 40 years when I discovered her abilities. She did however keep some of the Doric Scots phraseology through her long adult years in Edinburgh. North of her origin on the Black Isle, Norn (a dialect of Norse origin in Caithness) was spoken till the mid to late C19th, but that has truly gone from this earth. I recall that Lowland Scots (Lallans) is an official minority language of the EU but just what support that entitles it I’ve no idea. There is now one school on Mann teaching in the Manx Gaelic of this piece of the old Lordship of the Isles, but that version of the language of the Gaels remains so far without EU recognition. 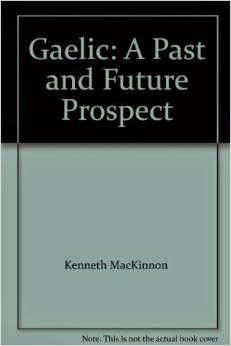 On my shelf I have Kenneth MacKinnon’s 1991 book ‘Gaelic, A Past & Future Prospect’ in which he strongly argues for the value of bilingualism and avers that we monolinguals are culturally impoverished. Certainly many parents in non-francophone areas of Canada seem to agree with that idea when they send their kids to French immersion schools. I recall when staying on Cape Breton Island, Nova Scotia in 1971 hearing Gaelic spoken on the street, where now that would be a whole lot less likely. However those coal-mining Cape Bretoners are significantly better off today than they were then, at least partly because their mentality and aspirations are now more closely aligned with the national norm. My sense is that the restoration of interest in minority languages and dialects, including our Canadian aboriginal languages, is of value in that it helps each of us better understand our own special cultural heritage, and rounds out our sense of who we really are. Arguments for the restoration of bilingualism where the second language is not the language of commerce, science and government, troubles those of us for whom foreign language acquisition is hard work (perhaps most people). My goal is to have my Gaelic again be about as good as my French and Latin – i.e. enough to get a sense of how the language is lived and used, and appreciate its songs and even literature, but I am not willing to pursue a spoken fluency of which I could make little use. Years ago when my Gaelic was better than it is today, I had acquired enough to navigate the signage of the villages and byways of the Connemara Gaeltacht for a week, and that still seems about right.